The AV Wall will be on display at the Palmdale Amphiteater Nov. 8-13. The monument is open to the public around the clock during the display period. Admission is free. The annual Veterans Day ceremony is planned for 11 a.m., Nov. 11. 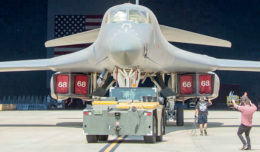 A Candlelight Memorial Walk followed by Taps will take place at 9 p.m. that evening. 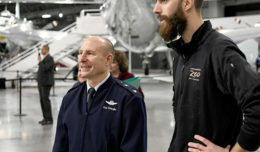 Taps will be played nightly at 9 p.m.
As part of the Veterans Day ceremony, volunteers will show honor, respect and gratitude to all veterans by helping to distribute special “Thank You” pins provided by AV Wall to all veterans in attendance. “This ceremony is a small token of this community’s love and appreciation of our veterans, their families, and their joint sacrifices,” said a spokesperson for the organizers. Air Force veteran Frank Graves will sing the National Anthem. The AV Wall is a half-scale size tribute monument of the Vietnam War Memorial in Washington, D.C. It is cared for by Point Man Antelope Valley, a veterans outreach organization that ministers to veterans of all wars. 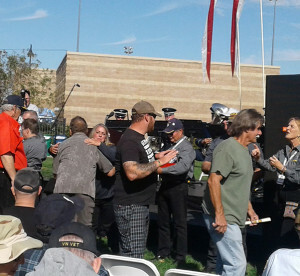 Veterans take part in ceremonies at the Palmdale Amphitheater in 2017. Part of the Veterans Day celebration will include the display of the AV Wall Nov. 8-13. PMAV is a non-profit, faith-based 501(c)(3) autonomous organization that is fully financed by donations. PMAV is under the umbrella of Point Man International Ministries, Spring Brook, NY. 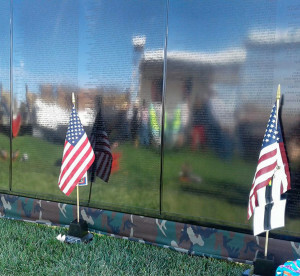 The concept of a local mobile Vietnam memorial wall was first discussed in 2005 when a committee celebrating the 10th anniversary of the Palmdale Playhouse was looking for a mobile wall to display at the “A Piece of My Heart” play. The play, by Shirley Lauro, details the stories and struggles of six women who served in Vietnam. A mobile wall would be the perfect tie in, but none were available at that time. “Why can’t we build our own wall” was asked by a Playhouse staff member, and the concept took off! It took four years to raise the $102,000 to fabricate the wall. Signs and Designs, Inc., of Palmdale was integral in the manufacturing and engraving of the wall. Each year, upon the release of additions and changes to the wall by the Department of Defense, Signs and Designs, Inc. updates the panels. 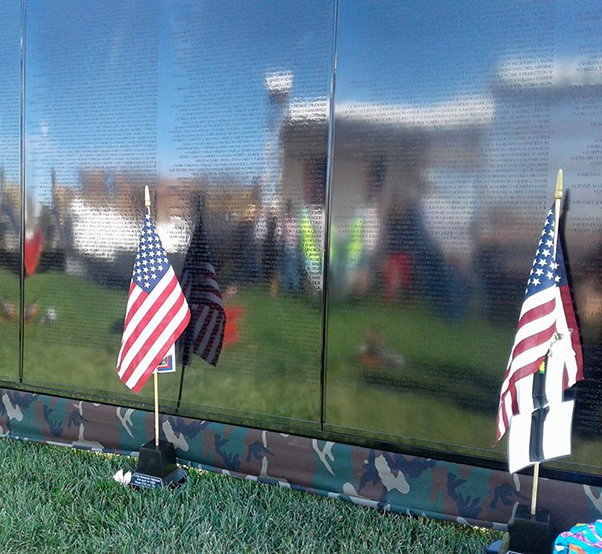 As of May 2018, there are 58,318 names on the Wall. AV Wall sponsors include Signs and Designs, the City of Palmdale, Lockheed Martin, Hunter Dodge Chrysler Jeep Ram and Green Valley Nursery. For more information, visit www.AVWALL.org, Facebook @avwalldisplay, or call 661-524-6408.